Over 30,000 to diamonds to choose from. Explore our vast inventory of over 30,000 certified Diamonds in the easiest user friendly way possible. Plug in your preferences and watch as we narrow it down to the stone of your dreams. Each diamond comes with a guaranteed GIA certificate which is the highest standard in the diamond trade. Each certified by the diamond authority. At USA Jewels we believe in adhering to greatest possible level of merit in the diamond trade and that begins and ends with GIA. The foremost authority in grading diamonds, GIA certifies every diamond in our search inventory with the utmost attention to detail and accuracy. You can rest assure that your diamond will be exactly what is promised. Most Bang for your Buck!! USA Jewels never believes in depreciation of any of our products and we take special attention to our diamonds. Each stone has a lifetime upgrade policy that holds the investment you make today for tomorrow. With highly competitive pricing and the most illustrious certification in the diamond trade today, your diamond purchase is value driven and created. Give us a call, we want to hear from YOU! The tables listed below describe the gem characteristics used in the selected piece of jewelry. To find information about each individual stone please click on the Stone Map Tab above if available. The stone map provides detailed information of stone type(s), cut(s), quantities and sizes set in the piece of jewelry. An appraisal is a document stating the approximate retail replacement value of an item. It is calculated using current market data, which reflects typical retail prices. The appraisal includes the cut, color, clarity, and either carat weight for diamonds or millimeter dimensions for gemstones, and the craftsmanship of the item. Your appraisal ensures that in the case of loss, theft, or damage your insurance company will give you an equal replacement of your item. The more information contained in the appraisal, the better chance you have of receiving the exact replacement for that item. 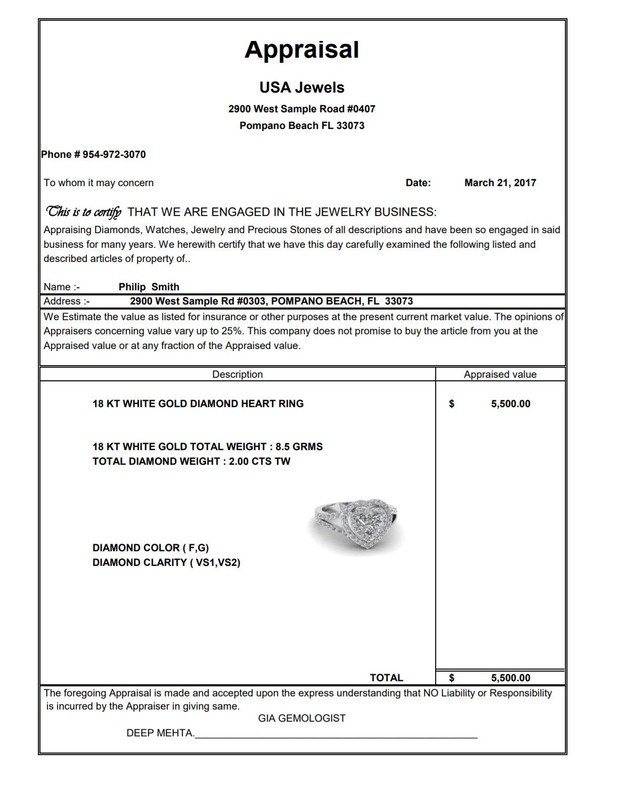 Your insurance agency can rely on this appraisal to calculate a coverage rate for your diamond or piece of fine jewelry. Keep up with our upcoming product offerings & sales. Subscribe with us and we will share with you some great deals and most craved jewelry items. "Where You're Your Own Jeweler"